So here it is--my 1001th post. I'm pretty proud of myself that I made it into blogging this far. I started it 5 years ago and am still going strong. In fact, it was less than 3 years ago, that I was celebrating my 200th blog post, so that should tell you something about how much I've taken to blogging. In fact, I've been pretty impressed in that I get about 10,000 hits a month. I consider that to be pretty good for a blog that is just a miscellany of my mind. While I liked the early years, it's really been the last three years wherein I pushed to challenge myself to regularly write and produce on my blog through 365 Projects and that's helped immensely in getting over the 1000 threshold. Now, what's interesting is not only that a random Ray Bradbury story is my most popular post of all time, but that it still has more visits than if you added spots 2-4 together. It has over 11,000 hits and for the life of me, I cannot understand why. So where has all this blogging lead me to over the years? I read a lot more nowadays. I edited and published a book. 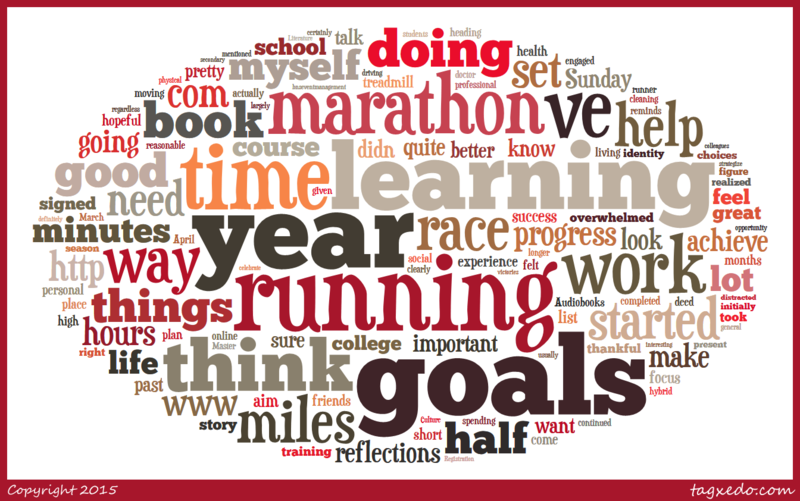 I do a lot more goal setting (and actually meet many of said goals). I take a lot more time for reflecting and thinking. I share deeper thoughts that others are often thinking and happy to know they are not the only ones. I continue to hone my own writing style and communication approaches. I have fun in sharing this blog with people. From this list, it's pretty clear to see that running has been a big feature of this blog. When I look at the time I started to running, I know that writing about it--sharing my expereinces and working through the challenges of running--in this blog proved instrumental in formulate my identity as a "runner"--but it's only now that I realize that it also formulated my identity as a blogger. My ongoing musings about running led into finding other ways of constantly engaging in writing on the blog and coming up with my 365 Projects and such. Teaching and my work in higher education has also been important and this has been a place for me to negotiate and reflect my role as an educator as well. Well, I think that's all I have. It's been a great 1000 posts and I hope to keep going strong. What about you reader? Are you blogging? If so, share over your link. If not and you're just reading this one, I'd be curious to hear what were some of your favorite posts. Thanks for reading and see you at the 2000th celebratory post!